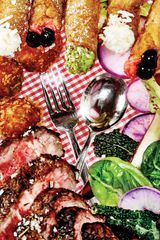 The grandiose hotel blowout has been a New York culinary tradition for nearly a century, and in recent years the place for that blowout was unquestionably Lespinasse at the St. Regis. But that gilded room closed a few weeks ago, and our choice for its successor (with apologies to Messrs. Ducasse and Vongerichten) is Atelier, at the new Ritz Hotel. 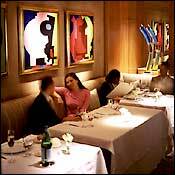 Ducasse and Jean-Georges are institutions unto themselves, but as soon as you walk into Atelier, you know you’re at the Ritz. The bar is manned by a gentleman (Norman) who has been at one Ritz or another for a thousand years. There’s a talented young chef in the kitchen (Gabriel Kreuther) producing inventive Francophile dishes (we recommend anything involving foie gras). And, if you’re feeling really grandiose, there are several varieties of caviar costing up to $100 per tiny bite. After all, the Ritz is still the Ritz..